The Scottish King James VI, who became King James I of England, was also a poet which might seem surprising considering the turbulence, and violence, of much of his life. Perhaps he took great comfort from being able to sit and write poetry as a diversion from being troubled by the trials and tribulations of royal responsibilities. Records show that he was born some time during July 1394 at Dunfermline Abbey. He had a troubled childhood, losing his mother at age 7 and then an older brother, David, who was murdered possibly by a member of the Albany Stewart clan who wanted the Scottish crown for one of their own. The young Prince James survived though, usually with heavy protection, but a decision was made at the end of 1405 to send him to France for his own safety. Unfortunately he was captured by English pirates while en route and delivered to the custody of the English King Henry IV. 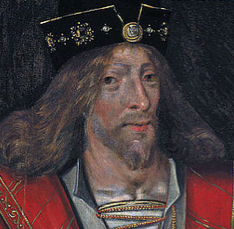 While in captivity he became King of Scotland at the tender age of 12 but unfortunately he remained uncrowned during a period of some eighteen years of detention. James was well educated and grew to respect the English ways, even fighting for them against the French. He was eventually released on payment of a ransom and journeyed north with his new wife, Joan Beaufort. He was not universally popular on his return home with the people facing higher taxes to pay the hefty ransom of £40,000 and his early years as the newly crowned king were made extremely difficult due to the lack of crown revenue. The coronation had taken place at Scone on the 21st May 1424. History shows that this was a time of constant in-fighting both north and south of the border, with the various Scottish clans constantly at each other’s throats. James had been seen to be particularly against the Albany Stewarts which was not surprising considering the open hostility of the previous decades. Their destruction in 1425 prompted a serious and, ultimately fatal, conspiracy against the king. It gathered force at a rapid rate and the king’s fate was soon sealed. King James was murdered on the 20th February 1437 at the age of 42. He had been trapped in a sewer tunnel of the Blackfriars monastery in Perth. Along with the Queen he had tried to escape from some thirty conspirators but was unable to do so. Many considered him to be a tyrant and his regicide was not mourned by many. It could be argued that the poetry that he left behind did not sit well with such a character but, nevertheless, it exists.